The worst part about drinking wine at home is getting your wine glasses to be properly cleaned in the dishwasher. 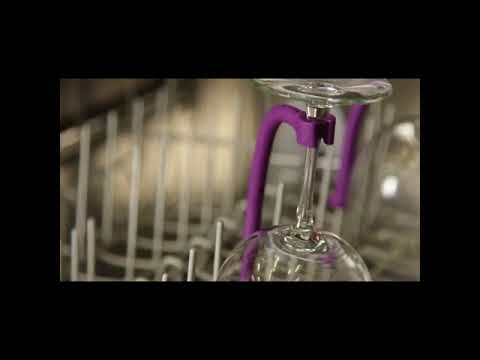 This dishwasher wine glass tether attaches to your wine glass's stem to keep the wine glass from tipping over through the dishwasher's washing cycle. Hollow base slides over dishwasher post. End clasp clips onto wine glass stem. Adjust the rod to fit the glass on either the top or bottom rack of your dishwasher.